Here are the quickest ways to make Windows 10 dish out helpful information when something on the desktop leaves you stumped. n each case, Windows fetches help, either by going online, fetching built-in instructions, or leading you to a tutorial built into Windows 10. Press F1 when on the desktop: Press the F1 key from within Windows or any desktop program. 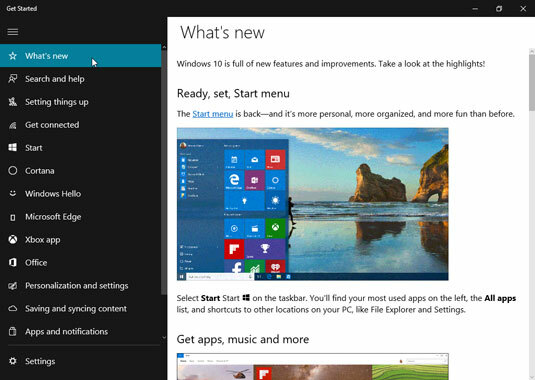 Start menu: Click the Start button and click the Get Started tile. Question mark: If you spot a little blue question mark icon near a window’s top-right corner, pounce on it with a quick click. App menu: Click the three little lines in an app’s upper-left corner, choose Settings from the drop-down menu, and then click the Help button, if available, on the pane that appears along the app’s right edge. The Windows 10 Getting Start app offers a short guided tour to Windows 10. To open the app, click the Start button and click the Get Started icon (shown here) from the Start menu. The app fills the screen, as shown. The new Get Started app offers a short introduction to Windows 10, including a short introductory video. Like most apps, the Get Started app lists icons along the left edge. Can’t see the icons’ labels? Then click the hamburger menu icon (shown in the margin) in the app’s upper-left corner. Clicking that icon in any app expands the app’s left pane, letting you see labels next to the mysterious icons. Windows 10 comes with a new app designed to make it easy to find just the type of help you need for your particular problem. Called simply, Contact Support, the app works much like those phone robots that make you press different numbers on your phone until you’re finally routed to the proper department. Click the Start button, click the Start menu’s All Apps button along its bottom left edge, and click Contact Support. The Contact Support program appears, shown here, and immediately starts to break your problem into manageable categories. The Windows 10 Contact Support program asks questions that route you to the correct department. Click the applicable category, and continue clicking through the menus until you find your preferred method of support. Clicked the wrong category? Click the backward pointing arrow in the window’s upper, left corner to return to the previous screen. Assure Software Support Plan: For a $149 annual fee, Microsoft offers one year of virus removal, and help by online chat or phone (and personal training, if you live close by to a Microsoft Store). Premium Software Support: If you only need help with Microsoft’s own software like Windows or Office, you can pay $99 for an hour’s worth of online chat or phone support. That $99 is per hour, however. And the charge is for each session, which shows why the Assure Software Support Plan might be a better deal for problems that occur frequently. Virus Removal and Protection: Stuck with a virus? 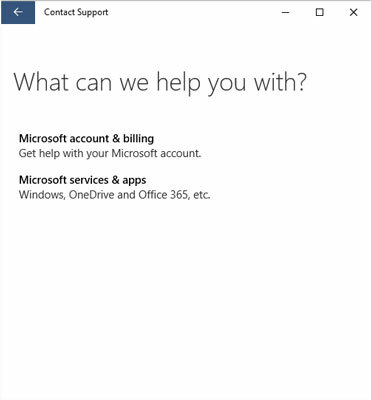 Microsoft charges $99 for each session that removes them. If you’ve purchased your computers directly from Microsoft’s online or retail stores, Microsoft offers extended service and warranty plans. By paying in advance, you can take advantage of Microsoft’s support plans without having to pay a per-incident charge or hourly fee. For free support, your best bet is the Microsoft Answers forum. It’s an online gathering place for confused owners, knowledgeable tech enthusiasts, and Microsoft employees. You visit the website, choose your category, type in your question, and wait. Sometimes a Microsoft employee will answer, but more often than not, somebody with a similar problem will chime in. The more people that respond, the more likely everybody will find a solution to a common problem. Visit the Microsoft Answers website and choose Windows from the Browse the Categories section. Choose your Windows version from the Browse by Version section. 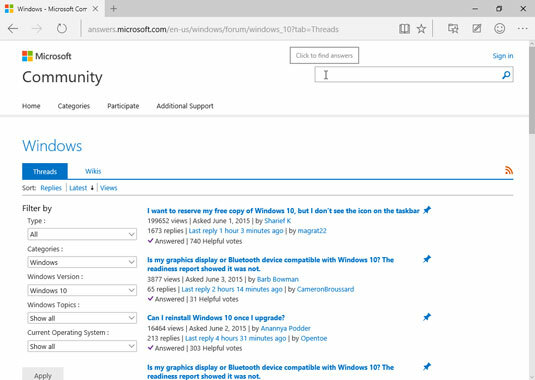 The Microsoft Answers online forum provides free tech support. Search the forum for previously answered questions. If something about your computer isn’t working correctly, it probably isn’t working for others, either. Type a few key words describing your problem in the Search box, located in the window’s upper, right corner, and press Enter. When the website lists the results, spend some time browsing them to see if any solutions work for your computer’s particular problem. If not, move to Step 5. 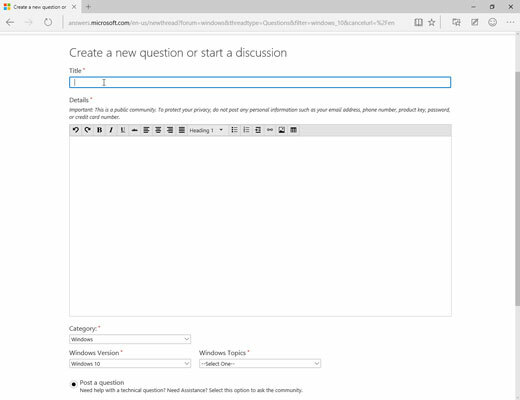 Type in your question, fill out a title, problem description, and category. Then click the Submit button. To ask a question, click the Participate link along the page’s top and choose Ask a Question from the drop-down menu. The website presents a form for you to fill in a title and details about your computer’s problem. Choose Ask a Question from the Participate link. Don’t forget to fill out the Category drop-down lists at the bottom of the form. They let you choose your Windows version, as well as narrow down your question by topic. Those little chores helps others find your question, and possibly provide answers, when they visit later on. And then, you wait. When somebody responds, a notice appears in your e-mail with a link to your posted message and the response. Click the e-mailed link to revisit the forum, where you can begin a correspondence that may solve your problem. The Answers Desk is free, and although it’s not guaranteed to provide an answer, it’s a good place to start.